Ethanol producers got a reprieve from the Obama administration, as the requests to halt ethanol blending were denied. Businessweek: - Ethanol’s discount to gasoline narrowed after the Obama administration rejected requests to waive requirements for blending the fuels. Ethanol rose 1.6 cents, or 0.7 percent, to $2.351 a gallon on the Chicago Board of Trade, contracting the additive’s discount to gasoline to 35.91 cents a gallon from 36.12 cents yesterday, based on December futures prices. Gasoline’s premium was 99.8 cents on Sept. 28. As it is, ethanol producers are losing money this year due to elevated corn prices (see discussion). 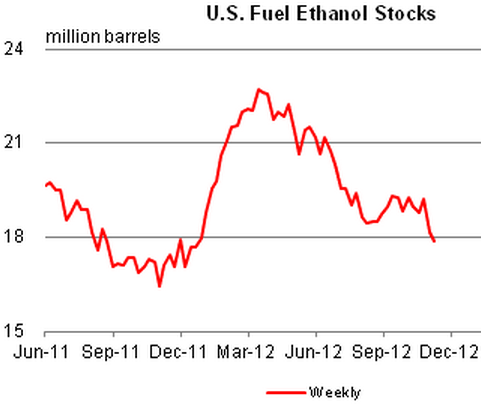 Production is down 14% from last year, which is showing up in declining ethanol inventories. Without this support from the Obama administration, ethanol firms would have been decimated. But regulation is keeping this industry alive - for now. Businessweek - Based on December contracts for corn and ethanol, producers are losing 29 cents on each gallon of the fuel made, up from 28 cents yesterday, excluding the revenue that can be made from the sale of dried distillers’ grains, a byproduct of ethanol production that can be fed to livestock, data compiled by Bloomberg show.